Perfect Resize (formerly known as Genuine Fractals) is the industry standard for enlarging and resizing images. It is renowned across the photographic and printing industries for its ability to increase image size without the loss of sharpness or detail that you might normally expect. The patented, fractal-based interpolation algorithms work like nothing else and the results speak for themselves. When making enlargements for canvas, it is common to wrap a portion of the image around the wooden stretcher bars, creating a gallery wrap. However, when wrapping an image in this way, important detail can be lost near the edges. The updated Gallery Wrap feature in Perfect Resize automatically creates extended margins by reflecting or stretching the areas near the edge of the image allowing you to create a gallery wrap without sacrificing any of the original image. Now you can get large format printing from a small format printer, quickly and easily. The new Tiling feature divides an enlargement into smaller pieces, preparing it for printing on a standard-sized printer. Just specify the paper size and overlap option and Perfect Resize will automatically resize the image and create individual tiles that are ready for printing. New in Perfect Resize is an improved version of the onOne batch processing engine. This allows you to resize an entire folder of images to a consistent size and create up to two new versions of an image. You can control the size, resolution, file formats, name and location, color space, and even add a watermark logo. 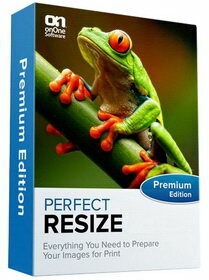 Perfect Resize is now compatible with Photoshop CS5 as well as CS4, CS3 and CS2. This new version is also 64-bit compatible for both Windows and Mac OS X and is up to 2 times faster than before on Mac OS X! Perfect Resize also integrates with Lighroom 2 & 3, and Aperture 2 & 3 giving you access to the best resizing algorithm wherever you are working with your photos. Please note that Lightroom integration requires a full installation of Photoshop. Have you ever tried making an 8×10 print from your digital camera file? You can’t get it to fit that 8×10 size—it’s either 8×12 or 7×10—because most digital camera sensors are a different aspect ratio from common paper sizes. This forces you to crop your image to get it to fit a specific paper size, and it can be difficult to determine how to do this and whether to do it before or after you resize the image. Perfect Resize comes to the rescue with over sixty built-in document size presets that allow you to precisely crop and resize your image in one simple step.